We are very proud and excited to have joined the Preferred Care at Home team. 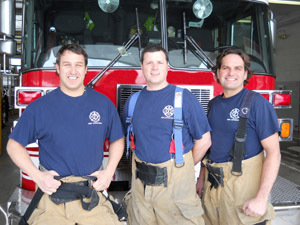 As three professional firefighter/paramedics, we see the need and benefits of senior home care on a daily basis. Nearly every shift on the fire department, we are called to help a senior in our community, who is having a little trouble living on their own. We know it can be a trying experience finding the right home care agency. That’s why we promise to provide quality, compassionate, and reliable in home care. With real life family experience and over 35 years combined service in the emergency medical field, we are now in a position with Preferred Care at Home to make a positive difference for your family, and the one you are trying to care for. We also understand that a seniors’ biggest concern is leaving the home where they built their memories. We will do our best to work with you and keep your loved one where they want to be – in their home. Working as partnership allows us to always be there for our clients. With the support of our families, we have decided to offer our services right where we live, the Macomb County area. We understand that your trust can only be earned with the best care for your loved one, when you are not able to be there.